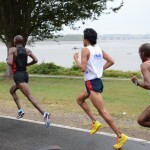 National Harbor, MD, October 7 – Samuel Ndereba and Fernando Cabada ran head-to-head for much of the third edition of the Woodrow Wilson Bridge Half Marathon today. As all of their battles have ended, it was Ndereba who got the best of Cabada on a cool drizzling day. It took Ndereba, a staple on the U.S. road race circuit, 65 minutes and 15 seconds to win the point-to-point 13.1-mile race which begins at the Mount Vernon home of George Washington, crosses the famous Woodrow Wilson Bridge and concludes at this modern resort called National Harbor. Cabada trailed by 45 seconds. Kellyn Johnson, on the other hand, made quick work out of the women’s race, becoming the first American woman to triumph here. 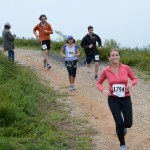 She took a commanding lead from the start and earned her victory by a margin of exactly two minutes in 1:13:24. For the 26-year-old from the adidas-McMillan Elite training group in Flagstaff, the $5,400 in prize money was her largest payday by far. With no women to push her today, Johnson left Washington for Boston with some energy to spare as she will line up Monday morning for the Tufts Health Plan 10K for Women. 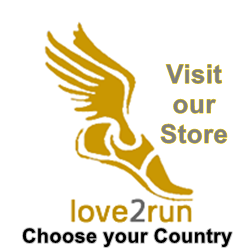 A pair of Ethiopians – Aziza Aliyu Abate and Wayinshet Abebe Hailu – followed in second (1:15:24) and third (1:15:44). Abate was second here to Samuel’s sister Catherine Ndereba in the inaugural running in 2010. 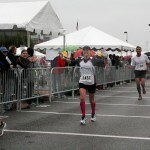 Johnson’s teammate and 2011 RRCA Roads Scholar Megan Herrick placed fourth in 1:18:19. 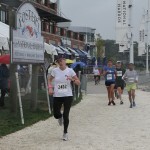 Michelle Miller of Damascus, Md., rounded out the top five in 1:19:57. 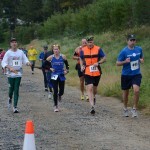 Like Johnson, Cabada benefitted financially from the ongoing efforts of Woodrow Wilson Bridge Half Marathon officials to bolster American athletes through the race. Last year, four $1,300 bonuses were awarded to Americans qualifying for January’s Olympic marathon trials. This year, the race set an additional $5,400 in American-only money plus an offer to double any prize money earned by an American who finished in the top 10 of the 2012 Olympic marathon or Track & Field trials. By virtue of her 10th place effort in the U.S. Olympic 10,000-meter trials, Johnson earned herself a double payout ($1,500 first open woman, $1,200 for first American) for a total of $5,400. 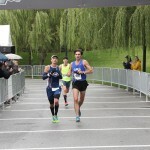 As well, with his seventh-place finish in the U.S. Olympic Marathon trials, Cabada doubled the $1,950 he earned ($750 for open second, $1200 for first American) for a total check of $3,900. 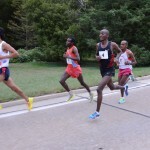 Girma ran 1:06:08, with American Frank Devar (1:06:32) and BirhanuTadesse (1:06:53) in tow. 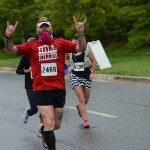 The 35-year-old Ndereba and Johnson also were awarded the RRCA Virginia State Half Marathon titles, as were Masters winners Sergey Kaledin of Russia (1:15:43) and Kristin Markowicz of Arlington (1:26:58). 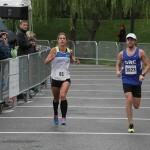 Winners of the Potomac Valley Association/USATF Half Marathon Championships were Miller and Devar. Masters champs were Markowicz and Joel Kinnunen. The race also hosted the third NIB Visually Impaired Half Marathon Championships sponsored by the National Industries for the Blind. Aaron Scheidies of Seattle (1:18:07), Matt Rodjom of Alexandria, Va. (1:22:36) and Amy McDonaugh of Irmo, S.C. (1:23:58) led their peers, earning $300, $200 and $100 respectively. 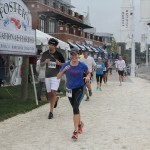 Some 3,425 runners registered with 2,364 finishers. 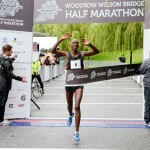 Click here for more details of the Woodrow Wilson Bridge Half Marathon 2012.